5 | 777 students enrolled. Certification in Online Technical Analysis course is jointly certified by NSE Academy & Elearnmarkets (NSE Academy is a subsidiary of National Stock Exchange of India). This course is a well tailored trading course enabling the learning of a robust trading methodology. A very small proportion of the active market participants actually & consistently generate returns from financial markets. This small proportion, is actually less than 10%. The Course focuses on the learning and understanding of trading patterns, trading tactics, trading psychology and money making techniques.This is a perfect blend of theoretical knowledge & practical expertise of the art of trading. Technical Analysis course comes with an added advantage of being a part of a unique community of market participants & market domain experts, with whom you’ll be free to share your views or clear out your doubts, lifelong. In this course you will be able to learn what is technical analysis of stocks & how to predict future movements from historical trend data. Certification in Online Technical Analysis course gives you powerful insights on profitable technical patterns and strategies supported by statistical analysis of markets. Participants will have hands-on training on various technical analysis software. The course explores the psychology of a successful trader. Trading Psychology plays a very important part within this course, which deals with understanding the self before you risk your first buck in financial markets as 90% of success in financial markets is attributed to Trading Psychology. Learn the art and science of trading with the help of extensive technical analysis of stocks, the analysis of financial charts, trading strategies and more. Learn Technical Analysis course that not only helps you understand the profit target but also aware you of risk involved in the trade. This course teaches the secrets of successful traders, unique ideas to trade in Intraday, Swing trade, Short term delivery, Futures & Options, The course by Kredent Academy is different from regular technical analysis because our studies are based on Logic & easy mathematical formulas, and are used by many successful traders, Brokers, and Fund Managers. Students enrolling for Certification in Online Technical Analysis course will be given a “Certificate of Completion” from NSE Academy, facilitated by Kredent Academy. There remains a provision of interacting with Mr. Abhijit Paul, the Master of Trading. Participants also get an opportunity to attend mock trading sessions. Comprehensive sessions with case studies and assignments are thoroughly provided. This is useful for freshers who are new to the market and would like to get introduced to the basic market terminologies and concepts and start a new career in the world of capital markets. New Investors, Retail Traders, Brokers and Sub brokers, Financial Service Professionals shall also benefit from Technical Analysis course as it shall enhance their knowledge base, understand market dynamics of demand and supply and help to predict future price movements. Internship- Practical internship of 10 hours available for the students at an additional fee of INR 10,000 + 18% GST. 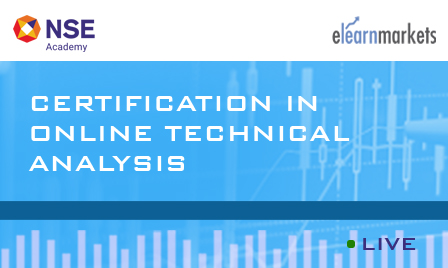 Under this course “Certification in Online Technical Analysis”, the participant will be required to appear for the internal examination and NCFM examination. Please note that the participant will get the Certificate of Completion of Certification in Online Technical Analysis after successfully clearing both the examinations. Internal Examination: This is an online examination hosted on the website of Elearnmarkets.com. NSE Academy certification in Financial Market (NCFM) Examination: This examination is hosted by NSE for which you need to go to the NSE approved test centre. The participants have to appear for the NCFM Technical Analysis, preferably within 45 days after the completion of the module/ course. Once the student enrolls in the Certification in Online Technical Analysis, he/she has to do NCFM registration. This is necessary in order to get the login credentials, so as to book the test date and the test centre to give the examination. Click here to register. Pattern of questions: 60 multiple choice based question of 2 marks each. Qualifying marks: 60% , There is negative marking in this module. The exam fees for the NCFM Technical Analysis Module are Rs 2,006 (two thousands six only) inclusive of service tax. After successful completion of both the examinations, participants can download their certificate from "My Certificates" tab available on Elearnmarkets dashboard within 10 days from the date of Certificate application done. NCFM Certificate has a validity of 5 years from the test date.